Yikes!!! Maybe Dark Trim will Come Back;) No, No Its Not. This Stair Case Had Very Shaky Hand Rails & Newels and was Not to Code. Unlike Most Stair Case Remodels where We Can Save the Steps & Paint them White, This Entire Staircase Had to Come Out! Naperville Foyer Remodel with New Stair Case in this Naperville Custom Home Renovation. 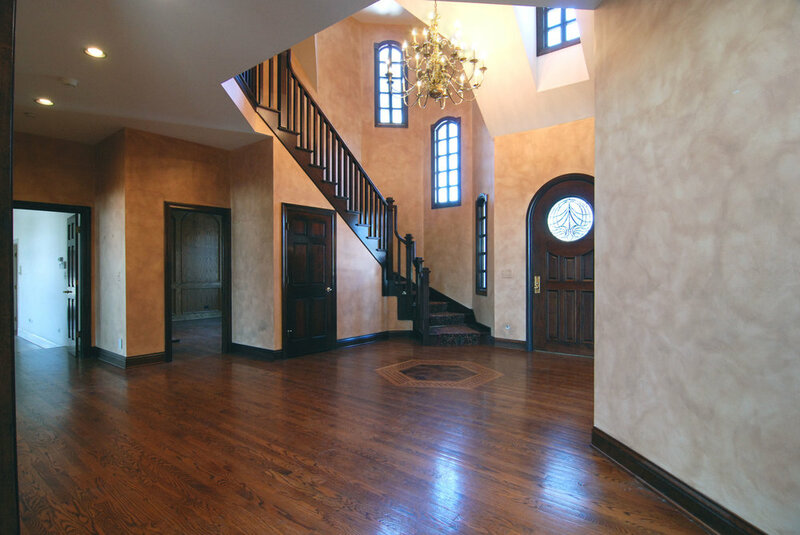 Looking to Update Your Foyer in Naperville? Northern Illinois Foyer Remodeling Specialist With New Stairs, Remodeling Current Stairs and Custom New Handrails & Newels. Square Balusters. White Treads. Check Out the New Knotty Alder Stained Doors with Painted Trim! Are You Looking to Remodel Your Foyer Staircase? Looking to Get New Handrails & Paint Some of it White? Need a New Foyer Staircase? Call Southampton Builders LLC. For Over 30 Years Southampton has Remodeled & Built New Hundreds of Custom Staircases. Curved, Floating, Basement, Attic, In A Turret like this Naperville Home or Just a Simple Straight Staircase Coming by the Front Door and Replacing Traditional Spindles for White Square. We Do it All the Time. Remove Old Stairs-Insert New Parts- Paint & Stain- Paint the Entire Foyer- Hang New Lights- Replace Closet Shelving- Install Carpet. DONE!